Born in McGregor, Iowa, Denise (Hulbert) Rohan lived in Elkader, Iowa, until leaving for U.S. Army basic training at Fort McClellan, Ala., in 1974. She served on active duty as a stock control and accounting specialist and repair parts specialist course instructor at Fort Lee, Va., until her honorable discharge in August 1976. Rohan and her husband, Mike, currently live in Verona, Wis., where she has served The American Legion since 1984. 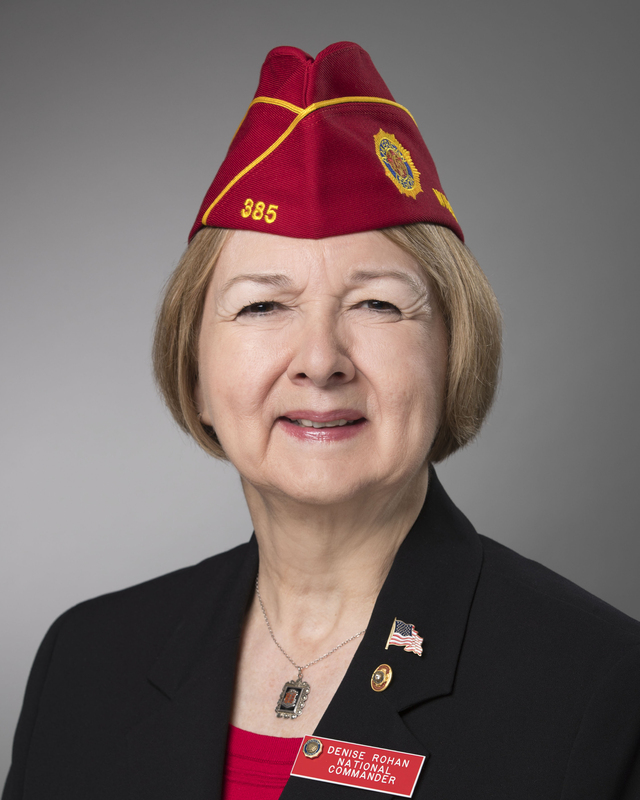 Prior to her transfer to Post 385 in Verona, she served as the commander of Post 333 in Sun Prairie, Wis., where she established a Sons of the American Legion squadron and chartered a Boy Scout troop. She has also served as the department commander of Wisconsin. Rohan and Mike are both 2006 graduates of the National American Legion College and 2015 graduates of the Wisconsin American Legion College-Basic Course, and have gone on to serve as department and national American Legion College facilitators. Rohan served the Family Readiness Group as a civilian volunteer with the Wisconsin Army National Guard 32nd Infantry Brigade Combat Team and 1-105th Cavalry Squadron. She also served with the 115th Fighter Wing, Wisconsin Air National Guard Airman and Family Readiness Program. Her theme as national commander is “Family First” and her fundraising project is the Legion’s Temporary Financial Assistance program and the Legion's service officer program. TFA awards cash grants to minor children of veterans who are eligible for American Legion membership. These grants help families in need meet the cost of shelter, food, utilities and health expenses, thereby keeping the child or children in a more stable environment.